Australian's should be celebrating this week after the success of the Australian team of 4 young riders took the Team Bronze medal at the World Youth [Endurance] Championships in Abu Dhabi at the week-end. Each rider was mounted on a registered Australian Arabian, and in addition there were a number of other Aussie Arabians being ridden by members of other teams. 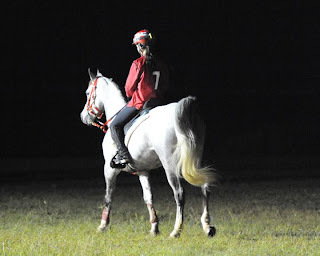 Allix Jones [NSW] riding Castlebar Moonlight [Straight Up US/Allira Park Light Fantastic], Alexandra Toft [Qld] riding High Society [WN Dasjmir US/Teressa], Brooke Warner [NSW] riding Kunama Safira [Howmarlan Trinity/Kunama Kyema] and Georgia Toft [Qld] riding Bremervale Arrogance [Desperado/Bremervale Katische]. In addition, Allix Jones finished second in a very exciting finish with a rider from Uruguay, to take an Individual Silver medal! Reserve rider for the team was Talea Hasko-Stewart, with Reserve horse being Zalman. We are blessed with a large number of capable young riders competing in endurance in this country and should be thrilled with this return to the podium against such tough competition from our overseas competitors. Uruguay won Team Gold, and the French Team won Silver. All the giants of the endurance world were there, including the UAE, USA, Spain, Argentina and South Africa. New Zealand placed 6th. The Arabian Horse Society of Australia sponsored the green and gold rugs worn by the horses, as it sponsors official rugs for all endurance teams competing overseas. The Society would also like to take this opportunity to congratulate the riders and your team supporters. We are so proud of you all! Interviews available - please contact david@beeboxmgmt.com for more details.